Sachin Tendulkar became first Indian sportsman to have his statue in the one of the most famous and prestigious tourist spot in London and is the only one to have had his figure unveiled in India. 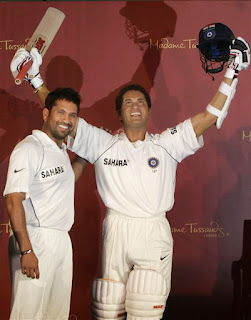 Delighted Sachin tendulkar said he was amazed by how similar the statue was to his own resemblance . The actual process of creating the wax figure by Madame Tussauds Wax Museum was started in February this year in Mumbai. Mahatma Gandhi, Pandit Nehru, Indira Gandhi, Rajiv Gandhi, P.V.Narasimha Rao are other Indians whose wax statues are placed in Madame Tussauds.